1983-03-21. New. Ships with Tracking Number! INTERNATIONAL WORLDWIDE Shipping available. Buy with confidence, excellent customer service! 1982-06-07. New. Ships with Tracking Number! INTERNATIONAL WORLDWIDE Shipping available. Buy with confidence, excellent customer service! 1984-06-30. Good. Ships with Tracking Number! INTERNATIONAL WORLDWIDE Shipping available. May not contain Access Codes or Supplements. May be ex-library. Shipping & Handling by region. Buy with confidence, excellent customer service! Windward, 1983-04-01. 2nd. Paperback. Used:Good. Conway Maritime Press, 1982-01-01. Hardcover. Used:Good. 1982-06-07. Good. Ships with Tracking Number! INTERNATIONAL WORLDWIDE Shipping available. May not contain Access Codes or Supplements. May be ex-library. Shipping & Handling by region. Buy with confidence, excellent customer service! Conway Maritime Press. Hardcover. 0851772552 New Condition. . New. Conway Maritime Press. Hardcover. 0851772897 New Condition. . New. HarperCollins Distribution Services. PAPERBACK. 0851773826 New Condition. . New. 1983-03-21. Good. Ships with Tracking Number! INTERNATIONAL WORLDWIDE Shipping available. May not contain Access Codes or Supplements. May be ex-library. Shipping & Handling by region. Buy with confidence, excellent customer service! Naval Institute Irituality, 1984-07-01. 1st Ed. (U.S.). Hardcover. Used:Good. Annapolis, Maryland, U.S.A.: Naval Institute Press, 1984. 240pp/illus. The excavation and raising of Henry VIII's flagship. The place of the Mary Rose in history, the search for the ship, the work of the Mary Rose Trust 1979-1982, the hull, the decks, the running and standind rigging, ordnance, the crew, oficers and life on board, salvage and recovery, remote sensing and survey methods used on the Mary Rose site. Clean. Hard Cover. Near Fine/Very Good+. 4to - over 9¾" - 12" tall. Conway Maritime Press. Hardcover. 0851772552 Like New Condition. . Fine. HarperCollins Distribution Services, 1982. signed by Author to title pages. Signed by Author. First Edition. Hard Cover. Very Good/Very Good. 4to - over 9¾" - 12" tall. Book Club Associates, London, 1984. 240 pp including index, quarto, illustrated end-papers, coloured and b&w plates and illustrations, fine copy in like, illustrated d/j.. "New edition, with details of the salvage". HarperCollins Distribution Services. PAPERBACK. 0851773826 Like New Condition. . Fine. Conway Maritime Press. Hardcover. 0851772897 Like New Condition. . Fine. G.B: Conway Maritime Press, 1982. Book. Fine. Hard Cover Cloth. First Edition. 8'' x 10.5''. The raising of the Mary Rose is the culmination of a massive eleven-year excavation that will completely transform our knowledge of the sixteenth century. The ship herself is the only survivor from a period of rapid, but poorly documented change in ship design and construction. In fact, she was one of the first examples of the classic sailing warship that made possible the great age of European expansion. Dust jacket colour illustrated. Includes colour photos, black and white sketches and an interesting foreword by Charles, HRH The Prince of Wales. All of our books are in the shop, and are 'real' books. We try to post the same day as the order. Descriptions are conservative. Postage rates may be lower than ABE estimate, please use Ask Bookseller a Question to confirm availability and postage cost, use [Ask Bookseller a Question] option below to confirm availability and get accurate postage quote for this item (the amount quoted is for an 'average' hard-cover book of up to 1kg in weight). Annapolis, Maryland, U.S.A.: Naval Institute Press, 1984. TEXT UNMARKED.. Signed & Inscribed By Author. 4th Printing. Hard Cover. Near Fine/Very Good +. 4to - over 9¾" - 12" tall. Portsmouth: The Mary Rose Trust, 1986. Trade paperback. New. 39p. : ill. (some col. ), ports. (some col. ); 21 cm. Includes: Illustrations, Portraits. London, United Kingdom: Conway Maritime Press, 1986. 240 pages prof ill colour and b/w photos illustrations . Reprint. Soft Cover. As New/No Jacket. London: Conway Maritime Press, 1983. Hardcover. Revised second edition. 240 pp. Glossary, bibliography, index. Fine book (no markings) / Fine dust jacket (ink name and address neatly stamped on bottom of front dj flap). A clean, fresh copy. Annapolis: Naval Institute Pres, 1984, 1982. Fourth Printing. Fine in green paper covered boards with gilt text stamping on the spine. In a fine dust jacket. Sub-titled: "The Excavation and Raising of Henry VIII's Flagship". A newly revised edition providing complete details on the salvage of the ship with an introduction by HRH The Prince of Wales. Laid-into the book is a photocopy of a 7/20/89 Boston Globe article on the re-surfacing of the ship. London: Conway Maritime Press, 1983 Signed by the author on title page: "For Dr. Lucien Rose with every good wish Margaret Rule" with grey sharpie. Foreword by HRH The Prince of Wales. Revised second edition with full details of the salvage. 9 chapters. Appendix. References. Glossary. Biblio. Index. 4to. 10 3/4" tall. Green boards stamped in gilt. 240 pages printed on heavy paper. Lucien Roses' blindstamp at corner of title page otherwise clean. Tightly bound. sharp. Dust jacket. Fine/ Fine. .
Conway Maritime Press. Hardcover. 0851772897 Signed by the author. . Very Good. 1983. Naval Institute Irituality, 7/1/1984. Hardcover. New. Hardcover and dust jacket. Fine binding and cover. Clean, unmarked pages. Ships daily. london: conway. 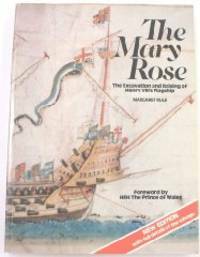 The book is full of details and pictures and plans of the excavation of the mary rose. . Very Good. Hardcover. 1st Edition. 1982. Seller: powellbooks of Ilminster Somerset uk. The Mary Rose: The Excavation and Raising of Henry VIII's Flagship. New ed. Conway Maritime Press, 1983. Hardback in fine condition with fine dust jacket. New edition.. Hardcover. Fine/Fine. London: Conway Maritime Press. Hardcover. 1984. New Edition. Large 8vo 240pp . Very Good in Very Good+ DJ. B&W and Color Illustrations. Foreword by HRH The Prince of Wales. Top corners lightly bumped. DJ front foldovers lightly stretched . Conway Maritime Press, London, 1982. Hardcover. Good. London: Conway Maritime Press, 1982. 224 pages, extensively illustrated in black and white and colour. . Second Impression. Hard Cover. Near Fine/Near Fine. 10 5/8" x 7 3/4". London: Conway Maritime Press Ltd, 1983. Revised second edition. Hardcover. Very Good/very good. Clean, tight 4to, 240pp. Jacket has a couple of tiny chips on the top edge of the spine area. Book has slight bump to bottom of spine. This was a phenomenal salvage operation of the flag ship of Henry the VIII of England. The photography is quite amazing and the discoveries fascinating. There is a brief history of maritime England in the 1500s and 1600s as well as a history of the ship itself. The book was written by one of the world's leading maritime archaeologists who isd now the Director of the Mary Rose Trust. London : Conway Maritime, 1983. Revised Edition. Very good paperback copy; edges somewhat slightly dust-dulled and nicked. Remains particularly well-preserved overall; tight, bright, clean and strong.. Physical description; 240 p : ill. (some col.), maps (some col.), facsims. (some col.), plans (some col.), ports. (some col.) ; 27 cm. Subjects; Mary Rose (Ship). Mary Rose Trust. Underwater archaeology  England  Portsmouth. Annapolis, Maryland, U.S.A.: Naval Institute Press, 1984. Fourth Impression. Hard Cover. Very Good/Very Good. 4to - over 9¾" - 12" tall. Annapolis, Maryland: Naval Institute Press, 1982 . (1984, 4th impression). Hardcover. FINE. As new - gift quality! Green cloth with gilt spine lettering. 240 indexed, annotated pages including bibliography and glossary. Illustrated throughout with diagrams and both black & white and color photos. 8x10.75x15" Account of the raising of the wreck of the Mary Rose, a Tudor warship that sank suddenly in 1545. Includes diagrams of the ship, photos of recovered artifacts, historical details about the sinking, discovery of the wreck, and details of how it was raised. The author, Margaret Rule, is the chief archeologist in charge of the project. n.p. (c. 1994).. Oblong 8vo; pp. 38; illustrated endpapers, numerous colour illustrations, some b/w illustrations; stiff stapled illustrated wrapper, a fine copy. Conway Maritime Press, 1982. Hardcover. Good. Condition: Very Good - in Very Good Dust Wrapper. Top edge of the text block slightly spotted. Text complete, clean and tight. BCA/ Book Club Associates / Guild Publishing , 1984. Hardback with dust wrapper . Fine/Fine. 4to: 240pp including notes, appendix, bibliography and index. " Profusely Illustrated in colour and black-and-white with photographs and drawings . Naval Institute Irituality, 1984-07. Hardcover. Good. Windward. Revised second edition. Paperback. Good. GC.Windward,1983.Revised second edition.Large format Paperback(small nicks and creases on the edges of the cover and spine)in GC.Illustrated with many colour,b/w photos,drawings,maps,plans,diagrams.Clean pages but with some stain marks on the outer edges,a couple of marks and nicks on the edges of the pages,owner sticker inside the edge of the front cover.The book is in GC with some shelf wear.Foreword by HRH Prince Charles.240pp including Appendix,references,glossary,bibliography,index. Conway Maritime Press, 1982. Book. Very Good. Hardcover. 1st Edition. spine cocked a bit, edge wear, rubbing, very minor fraying at spine. clean copy. jacket is not price clipped. .
London: Conway Maritime Press. Wraps,bp,ow VG. 1986.